The Hobbit: Deluxe Edition by J.R.R. Tolkien Hardcover Book Free Shipping! Format: Paperback. Notes: Item in good condition. (Item #Z0618002227Z3|0). All platforms are able to gain access and read EPUB formatting. This is not a physical book but an Ebook. THIS ITEM IS AN EBOOK NOT A PHYSICAL BOOK. J.R.R. Tolkien LORD OF THE RINGS 4 Book PB Box Set Ballentine. Condition is Acceptable. Shipped with USPS Media Mail. Each book features a leatherette cover with stamped title and all four books are held in a leatherette bound box with gold foil stamping. The PDF Books are those shown in the photo. Trending at $13.21eBay determines this price through a machine learned model of the product's sale prices within the last 90 days. The text pages are printed in black with green accents. It includes five full page illustrations in full color and many more in two color in addition to Thror's map — all prepared by the author. This is all the more remarkable, since he was a hobbit. The Lord of the Rings Three Volume Box Set, J.R.R. Tolkien PB (2003), Very Nice! The Lord of the Rings Three Volume Box Set, J.R.R. Tolkien PB (2003), Very Nice!. Condition is Very Good. Shipped with USPS Media Mail. Hardly look like they were read. Perhaps the original purchaser was too embarrassed that, if the MSRP is to be believed, they dropped $35 on a paperback three-book set. That’s messed up, people from 2003. You folks clearly deserved Gigli. Tolkien was a distinguished linguist and Oxford scholar of dead languages, with strong ideas about the importance of myth and story and a deep appreciation of nature. Author: J.R.R. Tolkien. Edition: 50th Anniversary Edition. NO EXCEPTIONS! Watch us on YouTube! The Tolkien Reader by Tolkien, J.R.R. Set of 3 ebooks (epub pdf mobi) audiobooks. Aragorn, revealed as the hidden heir of the ancient Kings of the West, joined with the Riders of Rohan against the forces of Isengard, and took part in the desperate victory of the Hornburg. This is a eighth printing under Ballantine Books, published in 1967. Condition varies. Scans of the book’s front and back covers are high resolution. Use the zoom feature to examine the covers up close. The Book Of Lost Tales 1 & 2 Paperback JRR Tolkien Books have never been read. Lost Tales 1 is in like new condition. J R R Tolkien. Author:J R R Tolkien. Product details. Competitive prices. counterfeits - ever! Why should you use Wordery. The Silmarillion by JRR Tolkien Paperback 1977 HOUGHTON MIFFLIN COMPANY. 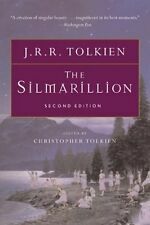 This is a rare, and hard to find edition of The Silmarillion by JRR Tolkien. This is the hughton Mifflin company paperback edition of this book that was released in 1977. It has a beautiful illustration on the front, but the book does show some wear and is in good used condition. Please look at all photos and please ask any questions that you may have before purchasing. This is a once-in-a-lifetime opportunity to own a piece of history. Photos are part of the description please look at them. ALL ITEMS ARE SOLD AS IS AND ALL SALES ARE FINAL. NO RETURNS ACCEPTED. History of Middle-Earth: The Book of Lost Tales by J. R. R. Tolkien, Hardcover. Condition is Very Good. Shipped with USPS Media Mail. The Hobbit by J. R. R. Tolkien. The Lord of the Rings Millennium Edition 7-Book Set One corner of the case and corner of one book is dented from being dropped. Also one side of the case is separating. See photos. Otherwise the rest of the books are in excellent condition. Smoke free home. The Hobbit; or, There and Back Again by Tolkien, J.R.R. 5 out of 5 stars - The Hobbit; or, There and Back Again by Tolkien, J.R.R. 12 product ratings12 product ratings - The Hobbit; or, There and Back Again by Tolkien, J.R.R. The PDF Book are those shown in the photo. The Lord of the Rings: 50th Anniversary Edition by J.R.R. Tolkien. John Ronald Reuel Tolkien (1892-1973) was a major scholar of the English language, specializing in Old and Middle English. Author J.R.R. Tolkien. THIS IS A LORD OF THE RINGS COLLECTORS EDITION WITH SLIP CASE. THE BOOK IS IN EXCELLENT CONDITION AS SHOWN IN THE PHOTOS. THERE IS VERY SLIGHT DISCOLORATION ON THE EDGES OF A FEW PAGES, AND ONE PAGE HAS A SLIGHT CREASE ON THE BOTTOM.